"Beneath the surface of stage magic, lurking beneath the displays of dexterity and skill, there is always an eerie, disquieting undercurrent, hinting at forces in the world beyond our understanding and control." says David Parr, "If you look at posters from the golden age of magic, when the great magicians were at the height of their celebrity, what you will see in the background are images of imps and ghosts and goblins." 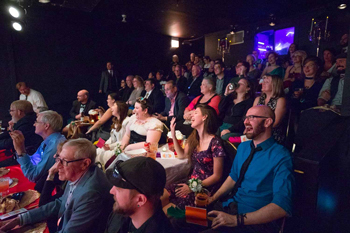 In this observation is the truth that made it almost inevitable that Parr would bring his prestidigital talents to the Otherworld Theatre Company's facility in East Lakeview. What more fitting locale for a show entitled Dark Magic than a former flower shop once supplying funeral greens to the two cemeteries barely a gravestone's throw away? So what can audiences anticipate encountering at Dark Magic? Followers of Parr attest to his love of storytelling, so his agenda is projected to include sleight-of-hand revolving around, among other subjects, evidence from the court records of the Salem Witch Trials, objects from the ill-fated steamship Titanic, the gruesome life and death of mentalist Washington Irving Bishop and a séance in the style of the Fox Sisters, whose "Telegraph to the Beyond' pioneered the 19th-century spiritualist movement. Audiences nowadays tend to associate stage magic with children's birthday parties or tawdry Casino lounges. Otherworld Artistic Director Tiffany Keane Schaefer hopes to change that, and other, mistaken perceptions, "For my generation, 'magic' is something you see on television—which might not even be real magic, but just clever video editing—instead of a living art form that can be accessible, observed and enjoyed by young people who might be experiencing it for the first time." "In the persona of the magician, there is always a hint of something supernatural, something otherworldly," Parr reminds us. Given the spectral community suggested by the proximity of historic landmark burial grounds right across the street, one can only guess at the possible responses to the invitation implied in Parr's signature illusion, involving a theatrical device traditionally called—what else?—a "ghost light." 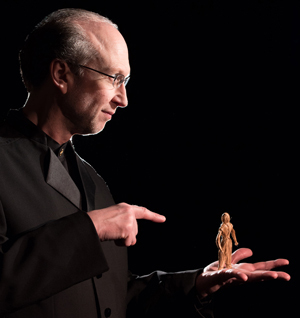 Dark Magic opens in Otherworld's Bradbury Theater on April 17.